Will President Bush's new policies erase past gains? Environmentalists are outraged over Bush administration policies they say weaken the landmark Clean Air Act. The president's proposed “Clear Skies” initiative would allow industries to buy pollution credits from cleaner plants as an alternative to installing equipment to reduce emissions. The administration also has relaxed a longstanding rule requiring older power plants to install modern pollution-control technology when they modernize. 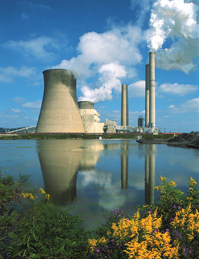 Plant operators say the changes will make it easier to reduce harmful emissions. Environmentalists contend they will merely reverse hard-won improvements in air quality over the past three decades. Meanwhile, several smog-ridden states threatened to sue the Environmental Protection Agency after it announced on Nov. 5 it was dropping more than 50 investigations into violations of anti-pollution rules.